People shouldn’t be forced to choose between eating well, and eating in an environmentally conscious way. 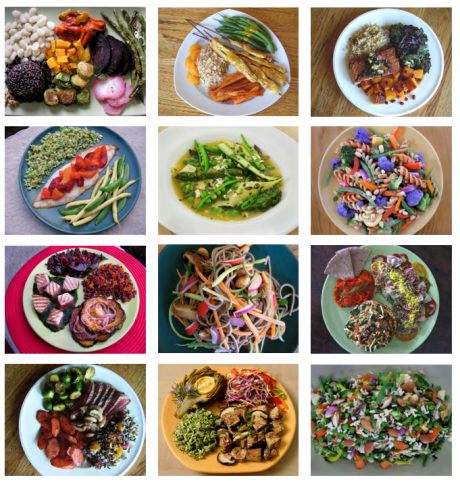 Picture: Images of meals used in the Planetary Health Diet report. The ‘planetary health diet' was announced yesterday by an international commission established to prevent millions of deaths a year and avoid climate change. But for the 5 million people in the UK who are estimated to be malnourished or at risk of becoming so, the high cost of this earth-friendly diet will be out of this world. The ‘planetary health diet’ is a welcome initiative to define a sustainable diet in the face of global environmental catastrophe and widespread lack of access to healthy food, and the ambition of the commission’s report is compelling. But with fresh berries, avocado, sourdough bread and fresh edamame served up on the planetary menu put together by the Guardian, the sample meals seem more like offerings from the latest book by Deliciously Ella instead of truly accessible, affordable food. There’s no price breakdown included in the menu, but meals like “courgette, cavolo nero and tomato gratin with breadcrumbs and almonds, and a green salad and polenta on the side” are likely to be out of financial reach for the almost 4 million children in the UK who are estimated to live in households that struggle to afford enough fruit, vegetables and other healthy foods to meet official nutrition guidelines as it is. These sample meals are simply intended to demonstrate that it’s possible to produce appetising food using the diet, but they raise an important concern. People shouldn’t be forced to choose between eating well, and eating in an environmentally conscious way. In Britain, where food deserts are becoming increasingly commonplace, the messaging around the ‘planetarian’ diet (to coin a phrase) has to be very carefully managed, or it risks being read as another middle-class fad instead of what it is: an urgent call to arms. The report acknowledges that the “concerted commitment can be achieved by making healthy foods more available, accessible and affordable in place of unhealthier alternatives”. The challenge, should we choose to accept it, is to double our national consumption of fruits, vegetables, nuts and legumes and halve our consumption of red meat and sugar by 2050. If the UK is to reach this target without leaving millions of families behind, business leaders and policy-makers need to work with farmers, supermarkets, suppliers and communities to tackle the gross inequality in the UK food system. And the government must lead the way by taking decisive action to subsidise healthy, sustainable food. We can start by ending the damaging conflation between ‘sustainable’ food and luxury. The point is left just hanging in the air that being ‘environmental’ is expensive as if it’s a law of physics. Healthy and environmentally sustainable food is not unavoidably or inherently expensive – it’s the result of political and economic choices. We are, understandably, quite resistant to being 'told what to eat'. And often the campaigning messages get it wrong (step up Peta, who have chosen this week to ruin vegetables for everyone). But hidden behind cheap price tags are existing price systems and subsidies which already influence what people decide to cook for dinner – or can afford to buy in the first place. People have become disconnected from the way food is produced, so wholesale systemic change needs to happen at the local level if it’s to gain enough traction. Schools, local growing projects and public health initiatives all have a part to play. Change the system, and you truly give people the choice to go green.